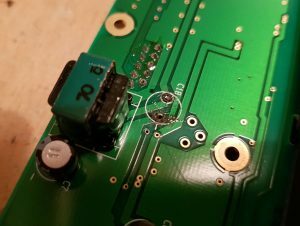 This page details the repair I made to the Display Board on my TS-850sat. 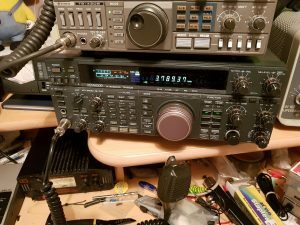 Symptoms: Blank display when the radio is powered up. Cause: Leaking cap on the display board which also eroded part of the pcb track. Solution: Remove old cap, Clean PCB, Fit new cap, bridge broken track. 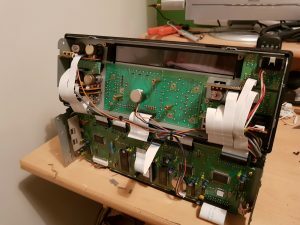 The First task was to remove all the casings and remove the screws that attach the front panel assembly to the rest of the chassis. In the image above you can see how the rear of the front panel assembly can be accessed by laying the radio upside down and rotating the front panel upwards to sit on what is the bottom of the radio. From here it is easy to remove the display board. Next I needed to identify the problem. This didn’t take long as the issue was obvious. As you can see from the image above there is a liquid clearly visible on the PCB. The only place this could of come from was the nearby capacitor you can see. Removing the capacitor showed the extent of the damage. 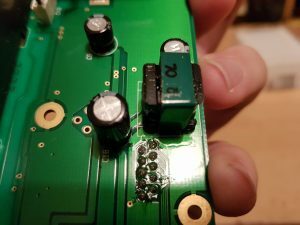 After cleaning up the PCB I found that 90% of the pad/hole on the trace from the transformer had been eaten away and so would need to be bridged when fitting the new capacitor. 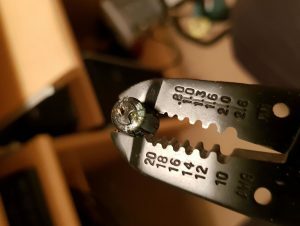 Once the new capacitor had been fitted I tesed for continuity between components to ensure the traces were intact. After reassembling the radio and powering it up there was a worrying few seconds before the screen burst into life.